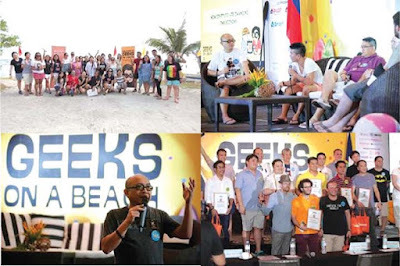 Smart supports tech start-up through 4th Geeks on a Beach (GOAB) conference. Smart Communications (Smart) though its developer network, Smart DevNet, strengthened anew, its support for the Philippine start-up community by co-presenting the 4th Geeks on a Beach (GOAB) conference held in Panglao Island, Bohol. A tech and startup conference that brought together hundreds of geeks from all over the world, GOAB featured industry thought leaders and highlighted local and international innovation-driven enterprises. The confab featured some of the brightest minds in the industry from the USA, Singapore, and Malaysia. Techstars co-founder and managing partner David Brown, Chris McCann of Greylock Partners, Crowdsourcing Week CEO Epi Ludvik Nekaj, 500 Startups Managing Partner and Investor Khailee Ng, 500 Startups corporate innovation director Arnaud Bonzom, Ideaspace.ph Director Diane Eustaquio, Dindo Marzan of Voyager and Smart DevNet’s Paul Pajo were just some of the resource speakers for this year’s event. “Our support for the start-up community has always been unwavering. We recognize the need to engage future business leaders in their start-up endeavors that are innovative and disruptive. We will continue to nurture and work closely with the community to achieve one common goal, and that is, to make the Philippine start-up ecosystem as successful as that of its neighboring countries like Malaysia and Singapore” said Pajo. During the conference, Pajo discussed how Smart partners with start-up organizations to provide inclusive technology to remote, underserved communities. Highlighted during his presentation were ShineOS+ and the Smart Wireless Engineering Education Program (SWEEP), flagship initiatives of Smart Communities–the umbrella corporate social responsibility program of Smart. Launched in 2011 in consultation with the Department of Health (DOH) and various stakeholders, SHINE is the first open-source cloud-based electronic medical record (EMR) and e-referral system in the country, readily deployable in any area with Internet coverage. The multi-awarded mHealth platform enables health facilities and professionals to create EMRs, send electronic referrals to other health facilities, generate reports, and send SMS reminders to patients. Now known as ShineOS+, it is one of the only six (6) EMRs accredited by the Department of Health (DoH). SWEEP aims to improve engineering and information technology education through industry-academe partnerships with universities and colleges all over the country.